This guide is for the action game. For the tactical RPG, see Fallout Tactics: Brotherhood of Steel. 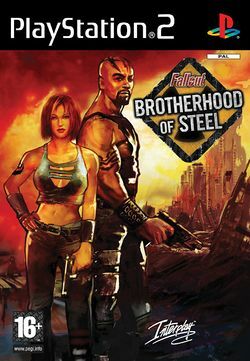 Fallout: Brotherhood of Steel is an action game developed and produced by Interplay for the Xbox and PlayStation 2. Released on January 13, 2004, BoS was the fourth video game to be set in the Fallout universe and the first to be made for consoles. The game chronicles the adventures of an initiate in the fictional Brotherhood of Steel. This page was last edited on 6 February 2010, at 03:51.